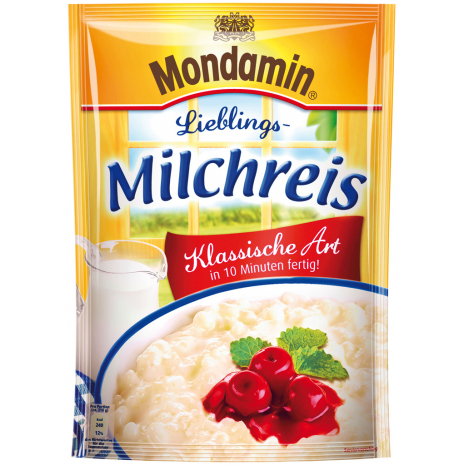 Traditionally delicious, Mondamin rice pudding provides excellent flavor in the matter of minutes. The ideal meal for in between. Serve with fresh berries or cinnamon sugar. Ready in 10 minutes. Makes 2-3 servings. Cooking instructions are in German language. 125g / 4.41 oz NET. WT. 51% rice, starch, sugar, thickening agent (xanthan gum), emulsifier mono- and diglycerides of fatty acids, flavors. May contain traces of gluten, dairy products and egg. 51% Reis, Stärke, Zucker, Verdickungsmittel Xanthan, Emulgator Mono- und Diglyceride von Speisefettsäuren, Aromen.